?Mothers come to me, almost every day, asking what they can do for their children?They tell me about the doctors they have seen and the hospitals they have visited?but still there is no clear answer for their children?As a Buddhist priest, I am talking to them and helping to overcome their suffering by listening and sharing their pain.? The Buddhist priest speaking to us was from a traditional Japanese temple ** kilometers from Fukushima. His voice was soft, and he paused for a few minutes after every sentence. Our entire group was listening intently, hardly taking a breath. Later, back in the van, as we traveled to the next temple, everyone was quiet and deep in thought. I was filled with sadness but also a firm conviction that it had been a right decision to visit Fukushima. When we started planning the 2012 Executive Committee meeting for the International Network of Engaged Buddhists, Jon Watts suggested having it in Japan. The Japanese EC members agreed, and Rev. Okano offered to host the program in his temple. Then they recommended that we organize study visits before the meeting to learn more about Buddhism in Japan and see the work being done by engaged Buddhist priests. The Japanese hosts developed three study visits and I chose to join the Fukushima group without much prior thought. I had been concerned about the disaster when it happened, of course, but it wasn?t until I listened to that village temple priest speak, that it fully hit me emotionally. As a development worker in my own country, after 30 years of war and a devastating tsunami, I have heard stories like this from different people. I have heard the stories of people who lost their loved ones, people who had all of their belonging destroyed, people who had nowhere to go and nobody to help, people who felt they had no future, people with no hope. Still, I never imagined that I would hear those stories in Japan. Japan has always been the dream country for other Asian nations. It is held up as the role model for economic development. I never expected to hear such stories of pain, loss, fear, helplessness and sadness. I never expected to hear about disenfranchised people and inactive policy makers. Based on what we learned in our classrooms, what we read in the newspapers and literature, and what we watched in films and documentaries, Japanese society was supposed to be the most modern, the best organized, the most disciplined and efficient. How did this happen in a ?developed? country? How did this disaster give them so much of a shock? Why is the recovery process not reaching all people? It?s true that most natural disasters are unpredictable and unpreventable, but in this case, people have mostly recovered from the earthquake and tsunami. They have not recovered from the man-made disaster at the Fukushima nuclear disaster. People who were living in the ?declared area? within 30 kilometers from the reactor have lost all hope of returning home. Many communities are still displaced. In some areas, people are allowed to return during the day, but they cannot stay overnight or sleep in their own homes. The whole social fabric has been disrupted. Even outsiders like us felt the loss. As we traveled from Tokyo, we went from the urban expressways to small, winding roads. The landscape has the lushness of our tropical rainforests. There were small mountains and water streams flowing past forest trees, fruit orchards, paddy fields, and beautiful old villages with traditional houses and temples. All of these have become like ghost towns. There were no people to be seen. We didn?t even see birds as we traveled. We visited a village on the border of the demarcated area and met a woman who runs a natural food restaurant. She is a mother with three daughters. After the disaster, her family stayed in a temporary shelter, but she decided to return to her home and her restaurant and she is now actively trying to rebuild her community. With a voice full of conviction, she told us, ?I am worried about my children?s future, but this is my home. It belongs to us. We have to bring normalcy back to our families and our communities. I have gone to Tokyo and participated in the protests. I hope our country?s policy makers heard our voices. Do not repeat this mistake. Give our children a safe future.? 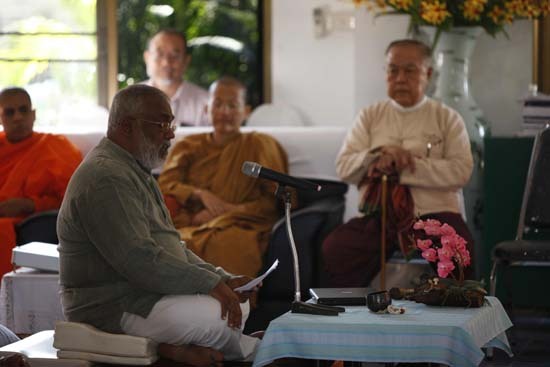 Our group was made up of civil society activists and socially engaged Buddhists and we were looking for answers. What lessons can we learn from this disaster? More than 25 years ago, the Chernobyl disaster taught us the danger of nuclear power generation. We know from modern research, ancient teachings, and our experience that everything is interconnected and interdependent. One side of the planet can never be safe, if people on the other side are doing things that are short-sighted and potentially disastrous. Yet with all of our resources, information, knowledge and technology, we continue to choose unsustainable paths. After Chernobyl, scientists and politicians told us that new plants had additional safety measures in place and this type of nuclear disaster would never be repeated.They said nuclear energy was a fully safe and environmentally friendly alternative to fossil fuels. Fukushima has delivered a clear and final verdict. It is not safe. We cannot predict or control all of the potential disasters. It is not a long-term solution and we must close existing plants and find a way out. As normal citizens we got this message. The common masses heard this lesson, but did the policy makers hear it? It doesn?t seem like they have. There are still many countries with reactors near population centers and important ecological habitats. They are not taking steps to close existing reactors and they are still planning new ones. The advocates say that it is a superior technology, an alternative to fossil fuels, and the best option for rapid economic growth because they can quickly scale up production. It?s true that many countries are facing real energy challenges. Countries like Sri Lanka have tapped all available options for hydro power. In India, the economy is booming, but poverty is a real threat to stability and democracy. The Indian government has to find urgent answers, and despite the availability of safer, sustainable alternatives, priority is being given to nuclear power. Construction started on the Kudankulam nuclear power station in 2001. The site is at the southern tip of India in Tamil Nadu and any disaster would almost certainly affect my home country, Sri Lanka. Despite this proximity, the Indian authorities have not sought any input or participation from their southern neighbor. Nor have they sought input from their own people. There are more than 1 million people living in a 30 kilometer radius of the plant, and local people, fearing a fearing a Fukushima-like disaster, have organized a People?s Movement Against Nuclear Energy. According to S.P. Udayakumar, one of the representatives, “The nuclear plant is unsafe. No public hearing was held. It’s an authoritarian project that has been imposed on the people.” The protestors have filed a Public Interest Litigation in the Indian Supreme Court requesting that all proposed nuclear plants are stopped until satisfactory assessments are completed by independent agencies. Indian officials have responded that the Kudankulam plant cannot be compared to Fukushima and the fears of the people are not based on scientific principles. ?We are not in a tsunami prone area. The plants in Kudankulam have a double containment system which can withstand high pressure. At least Rs 14,000 crore has been spent. If we don’t operate the plant immediately, it will affect the economic stability of our country”. Nuclear scientist and scientific adviser to the Indian Government of India Rajagopala Chidambaram has said ?We have learnt lessons from the Fukushima nuclear accident, particularly on the post-shutdown cooling system.? He added Fukushima nuclear accident should not deter or inhibit India from pursuing a safe civil nuclear program. After Chernobyl they told us they had learned a lesson and this kind of nuclear disaster would not be possible in the future. As the saying goes, ?Fool me once, shame on you. Fool me twice, shame on me.? What I learned from Fukushima is that we, as responsible citizens, cannot keep quiet. Nuclear disasters and nuclear waste affect people across borders and across generations. We cannot leave this decision in the hands of a few short-sighted government officials, who are driven by personal financial concerns and short-term economic gain. The larger the project is, the harder it is to stop. It builds its own vested interests and inertia. Social and environmental impact and sustainability are ignored. Even if our leaders are democratically elected, they are not representing our values or our best interests on this issue. The general public needs to be directly involved in the debates and decisions on such major decisions that can affect our lives today and impact generations to come. We need to speak up, mobilize, and act to see that there is an end to this nuclear mess. In a recent opinion piece in the New York Times, Ward Wilson wrote ?Nuclear weapons were born out of fear, nurtured in fear and sustained by fear. They are dinosaurs ? an evolutionary dead end?Nuclear weapons ? extremely dangerous and not very useful ? are the wave of the past.? All of the courageous people in Fukushima are trying to tell us the same thing about nuclear energy. Nuclear power is extremely dangerous and not very useful. Nuclear power is an evolutionary dead end. Even if it?s not the easiest option in the short-term, we need to demand that our elected officials invest in the growing number of energy alternatives that are truly safe and sustainable. The visit to Fukushima not only taught me a lesson about nuclear power, it also taught me a lesson about the future of Buddhism in Japan. We were inspired by the people we met and the stories we heard over the two days we spent in the Fukushima area. We were inspired for their commitment to rebuilding their communities. At the last temple we visited, a young priest gave us a tour. In one area, we saw ancient stone monuments that were fallen and scattered. It looked like a group of elephants had a fight and left a mess, but it was caused by the earthquake. The young priest told us that when the earthquake hit, he moved his family to a safe place in a nearby prefecture, and then he immediately returned to help other affected families. He spent many nights sleeping in a car and went for weeks without seeing his own family. He is hoping more people will return so they can fully rebuild the community. Before the visit, we had heard that Japanese Buddhism was in decline and that the priests were only in the funeral service business, but that was not what we saw. For people who are searching for best practices, the Buddhist priests who are working in Fukushima provide a wonderful example. They have brought people back to the temple by being socially engaged, by connecting with people, and by supporting them when they are in need. The best way to bring people back to the temple is to go out of the temple and connect with people where they are. ?CharathaBhikkhavecarikambhujanahitayabahujanasukhaya. ?